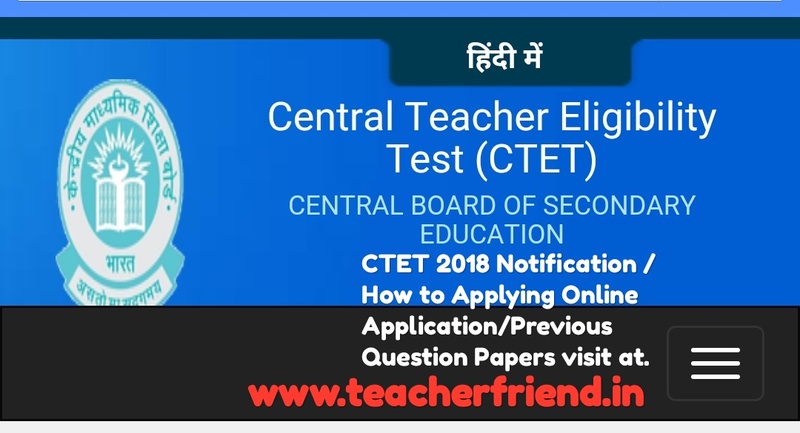 CTET September 2018 Notification/Online Application/Previous Question papers. The last date for submitting online application is 19/07/2018 (Thursday) and fee can be paid upto 21-07-2018 (Saturday) before 3.30.p.m. Teacher Eligibility Test known as TET is an Indian entrance examination for teachers. The test is mandatory for getting teaching jobs in government schools from Class 1 to Class 8th. CTET 2018 Educational Qualification Important Scheduled. Paper 1 is meant for teachers opting for Class 1 to Class 5 and Paper 2 for Class 6th to Class 8th It is conducted by both Central government and State governments in India. Most states conduct their own TET. The test is conducted in order fulfill and achieve the goals of the Right of Children to Free and Compulsory Education Act. Get Download Syllabus/Study Material/Previous Papers Click Here.